The final album recorded during Nick Drake’s lifetime, ‘Pink Moon’ is stark and foreboding – but traces of hope can be found in its lyrics. Nick Drake’s Pink Moon, released on 25 February 1972, is a short and intense masterpiece from the British folk singer-songwriter. By 1971, the 23-year-old was overwhelmed by depression and had lost all confidence as a live performer. His final public gig, at Ewell Technical College, in Surrey, in June 1970, had been abandoned halfway through the song ‘Fruit Tree’ before a disconsolate Drake walked off stage. With no immediate plans to make a new record to follow 1969’s Five Leaves Left and 1971’s Bryter Layter, Drake spent time recuperating at Chris Blackwell’s Spanish villa, at the personal request of the concerned Island Records chief. Drake then snuck away with producer John Wood to lay down a new album, which was recorded over just two late-night sessions at Sound Techniques in London’s Chelsea, in October 1971. Wood later said that “it felt like there was a kind of urgency about it”. Listen to Pink Moon right now. Pink Moon is Drake’s music at its starkest and most uncompromising: no other musicians, no arrangements, just Drake and his acoustic guitar and one piano solo on the title track, with its ill-omened pink moon a portent of disaster. Drake did not know what he wanted on the cover of his new album, except that it had to feature a pink moon. In the end, a surrealist painting by Michael Trevithick, who was the boyfriend of Drake’s sister Gabrielle, was chosen and seems fitting. The album, which is only 28 minutes long, has an unsettling simplicity. Drake said he didn’t want it arranged, just to stand “naked”. In the brilliant and bleak ‘Parasite’, Drake uses the device of a journey on the Northern Line of the London Underground to offer a chilling view of the emptiness of contemporary life. 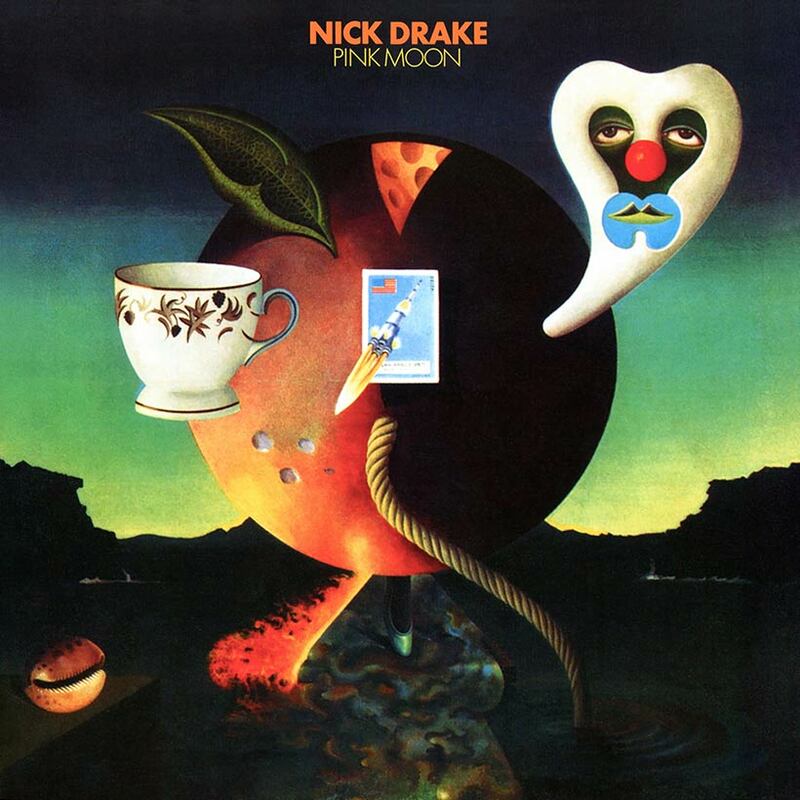 Pink Moon received good reviews, but its intimations of darkness (“Now I’m weaker than the palest blue,” Drake sings in the masterful ‘Place To Be’) left people feeling uncomfortable. Nevertheless, Island Records kept faith in the young singer, who suddenly appeared at the company’s offices with a big 16-track master-tape box under his arm and left the tapes of Pink Moon with the woman at reception. The lack of sales for Pink Moon disappointed Drake, whose depression was deepening. He died on 25 November 1974, at the age of 26, from an overdose of anti-depressants. It was a tragedy that passed largely unnoticed at the time. The three albums which Nick Drake had made in his short lifetime were all, in commercial terms, unsuccessful, even though leading musicians such as Martyn and Richard Thompson urged people to listen to Pink Moon. Eventually, long after his death, people took notice and Pink Moon posthumously went Platinum. The album’s last track, ‘From The Morning’, is notable for containing the lyrics “And now we rise/And we are everywhere”, which would later feature on Drake’s headstone in Tanworth-in-Arden. The lines offer hope that this wonderful album about loss and failure is also as much about resurrection. Pink Moon can be bought here. Listen to the best of Nick Drake on Apple Music and Spotify.